When we last visited the Pentacles in Card Six we were relieved to see that eventually they were getting or had asked for some help, either financial or practical. Someone had come to their rescue and the Two Figures fell to their knees with gratitude and appreciation. They had fallen from a height to a very low place in the Five when we were shocked to see them wandering the streets, ill, penniless and homeless. Of all the Suits, it was The Pentacles who seemed to have had their life well worked out and on the surface appeared successful. It just goes to show you that one never knows what is coming around the corner and I am sure the Pentacles were the most horrified of all by their change in circumstances and downward spiral of luck. They had worked so hard from the very first moment in the Ace when they had seized their Pentacle from Spirit and began the journey towards their long-term goal. Focused, committed and determined they had toiled away night and day while the other Suits enjoyed themselves (let’s not include the Swords here!). Something then went wrong, terribly wrong and they lost everything. Not to mention the material loss, they also lost their pride, dignity and self-esteem. They were reduced to begging in the street and having to knock on doors to ask for help. 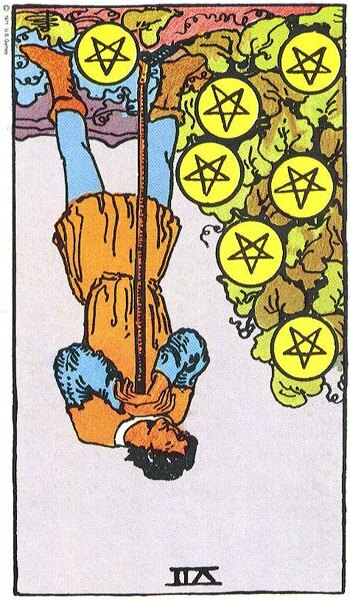 This did not come easily to the poor Pentacles who were used to being independent, self-sufficient, self-reliant and resourceful but they had a choice to lie down and die in the gutter or fight for survival. The Pentacle Suit and governing Earth Element also deal with the physical body and we all have an inbuilt instinctual survival mechanism that kicks in during times of terrible trauma and extreme desperation. The news often shocks us with stories of brave people who had to cut off their own arm in order to save their life after getting trapped in machinery. Then think of all the people who have had their lives and bodies destroyed as a result of horrific car accidents or bombs. Through endless pain and constant surgeries, skin grafts and rehabilitation they beat the odds and learn to walk and talk again. We have also heard of people trapped or buried for weeks after landslides or earthquakes who survive to tell the tale. The body and mind are amazing. They will do anything they can to protect us and help us to survive. Thankfully the Pentacles have not had to face such horrors but the pain and want they felt was relevant to their situation and was certainly not borne lightly by them. In the midst of all their anguish and despair, the Pentacle’s strong survival instinct kicked in, forcing them to do what they had to get through their ordeal. They found the help they needed which would allow them to slowly but surely get back on their feet again and live to fight another day. If we look at the Figure in Card Six, the man in the brown cloak, is the first one to receive the alms from the wealthy benefactor. We must now question from that Card, how much the other man in blue got? Maybe his needs were different, which required a lesser or greater sum of money. Possibly that man just needed some food instead of money, for he may have gambled it, drank it or bought drugs with it. It is impossible to tell at this stage but the benefactor was balancing the scales and therefore both got exactly what they needed. 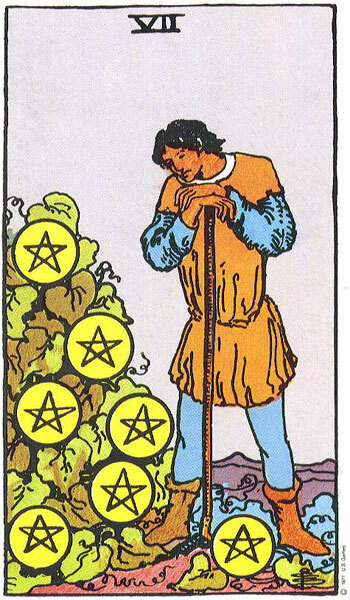 However, on interpreting the Seven of Pentacles, my interest and focus of concentration is on the man in brown. My theory, and it’s only my theory, is that this Man went looking for help from the wealthy man with very clear intentions of what it was he was looking for. The Man in brown had been successful before and possibly through circumstances outside his control, took a substantial loss or hit. He knows the process of business and making money. He most importantly knows the hard work and determination that goes into every successful endeavour. If he was able to do it then, there is a very good chance that he could do it again. In fact he knows that there is more than just a chance as he is 100% sure. The only thing he lacks are the means and resources to get started again. He is not looking for much but just enough to buy a few tools and have access to a bit of land or premises. The rest he can do in his sleep. I have a hunch that the Man in brown had applied for some kind of grant from a local enterprise organisation or approached a family member or friend looking for backing for his new venture. Whoever it was he sought help from was impressed with the Man’s proposal and financial forecasts. He seemed to know what he was doing and they also saw something else that sealed the deal. They saw the determination and commitment in his eyes. One of them is so convinced, he has decided to back him and has put his stamp of approval on the grant application or agreed to provide the funds for him. We also must leave our minds open to the possibility that the Man in brown, through a twist of fate, divine timing or just pure look has inherited some money or land. If he has, then he knows exactly what he is going to do with it. The Man in brown has been given a second and chance and does not have any intention of messing up or letting outside influences destroy his efforts. He has learned some hard and painful lessons out on the street and had much time to reflect on any mistakes he made and where he might possibly have gone wrong. After receiving his grant or loan, he also took advantage of the Business Mentoring he was offered and now stands in a very strong position to get his life back on track. He knows what he is doing and can’t wait to roll up his sleeves and get stuck in. As we enter the scene in the Seven of Pentacles, we meet this character again. Much time has passed since we saw him kneeling at the foot of the wealthy man. He still keeps in touch with him but now it is more on an equal footing. The Wealthy Man likes to hear what he is doing and often comes to have a look over his accounts and give constructive advice where he can. He also invites him to interesting trade shows and introduces him to other business colleagues who may be of some help to his enterprise. Here we see him take a break from his work. We are lucky to have stopped by today to meet this Man for it is not often that he takes a break. Since he got that field he is up and gone at dawn and rarely comes back before nightfall. He barely sees his family or friends, but they understand that for the moment it is what he has to do and necessary if he is going to reach his goal or business target. He had his eyes on this piece of land for a long time and never imagined that he would actually own it one day. He knew that the soil in this region was rich in nutrients and minerals. It had also been worked organically by the previous owners who had run a very successful business growing organic vegetables. So successful, that they had now moved on to a bigger venture further down the road. Since buying the land, the Man has made friends with the previous owners who give him brilliant advice on growing crops. Before he started planting his own, he had gone to work alongside them for three months to get much-needed hands-on experience. When the time came to purchase his first seedlings, he knew exactly what to look for and knew who the most reliable suppliers were. He was all set and ready to go. He had ploughed and turned the field, removing any large stones, he had cut back the branches of bordering trees so that the land would get adequate sunshine. At times his back felt like it would break or that his legs would give way but he ignored them and kept going. Muscled, strong, fit and healthy he ate well and worked hard. He was no unrecognisable to the person who had been down and out on the streets in Card Five. He had his confidence, pride and self-esteem back once more. Others around commented and remarked that he had no life but they were very wrong for he loved every second of what he was doing. He watched the weather and consulted with his new organic farmer friends and waited for just the right time to plant his precious seedling Pentacles. It took him days to get them all down and he marvelled at the sheer beauty of his field on completion. However, the hard work was not over. He then had to give considerable time to watering and feeding his Pentacles. He watched over them lovingly as if they were his children. As they began to grow, he would spend back-breaking hours crawling down the lines of sprouting Pentacles, pulling off the undershoot or unhealthy leaves to ensure that his crop was healthy and strong. He spent nothing on himself as any spare money that came his way was spent on repairing tools or replacing the tyres on the tractor. Some of his friends dropped by every now and then to see how his field was getting on and at times helped out with the heavier work. His friends thought the seedling Pentacles were taking forever to grow and marvelled at his patience and perseverance. Some even asked him if he was doing the right thing as the field and its crop took up every moment of the Man’s life. The Man did not see it that way at all for he looked on the field as his life and one never gives up on life. Yes, the work was unending and each day presented a host of new problems or challenges that he just had to take on board and get on with. His Wealthy Friend and Sponsor dropped by regularly to check his progress and even he too, remarked at how slow the growth was and whether the man would have the patience to stick it out? It was a stupid question really for the Wealthy Man had given his backing to this Man for a very good reason. Many early mornings as he lay in bed listening to the dawn chorus he would think of the Man and with certainty know exactly where he was at that moment in time. Down at his field hard at work of course, where else? He was showing remarkable tenacity, determination and commitment. He had no doubt of his success for it was guaranteed by the sheer amount of hard work he was putting into the venture. It could only go one way. However, the Wealthy Man was slightly worried about the bull-dog attitude of the Man. He worked so hard all the time that he rarely took the time to review or assess his aims or goal. He had seen his stubborn and relentless streak and as his Sponsor, was obliged to draw the Man’s attention to his Business Plan. He needed him to sit down and go through it. Check to see if he was on time, on budget and on target. He also needed to assess whether any changes needed to be made to the original plan that had been drawn up in the very early days. He needed to know that the Man was maximizing his potential. His Business Plan would highlight any areas that weren’t working or needed adjustment. He was always busy toiling in the fields so it was hard to get him to tend to this important side of the venture. Some weeks later, The Man walks out into his field, hoe in hand to dig little furrows beside the now, thriving Pentacles. The previous weeks have been hot and dry with not a sight of rain. Today he intends to bring water to his Pentacles from the massive rain barrels at the side of the field. He spends the whole day hard and work, barely breaking for lunch. Towards the evening he has completed the task and relaxes in the knowledge that his crop can now access the water that is so essential to their survival. The evening is calm and balmy as he walks out into the middle of the field. He stops beside a large Pentacle Plant and for the first time in a long time begins to contemplate their shape and form. The last time he really looked at them for their beauty was back when they had first begun to stick their heads out of the ground. The work was hard and endless from then on, but now as he gazes at their amazing shape and size, he begins to take stock of all that he has worked so hard for. Resting his hands on the hoe he relaxes his body and takes in the fruits of his labour. The Pentacles are large, luscious and abundant. He is overwhelmed by the sheer size of them and for the first time acknowledges what he has done. Through hard work, endless effort, endurance and perseverance he has pulled it off. He has put his very best effort into getting his Pentacles to this stage of growth by applying all his knowledge and skills along with blood, sweat and tears. Attention to detail was vital and all those days pulling off dead shoots and leaves has allowed his crop to flourish and thrive. He knew so many people ignored this side of things when growing their own crops. He had learnt from the Masters of this Business and all going well might be able to call himself an expert one day too. Harvest time is approaching very soon and yet again, the timing has to be spot on. Not a day too early and not a day too late if he is to get the best out of his Pentacles. He lifts the hoe in his hand and gently severs the stalk of one of the Pentacles and pulls it aside. It is large and firm to the touch and bright yellow gold in colour. The sun has done its job but will it be juicy and sweet inside. The man cuts off a slice of the Pentacle to taste. He chews slowly and deliberately allowing the juices to flow and release their flavour and scent. Wonderful he thinks, absolutely delicious. However, on examining the colour of its flesh, it appears slightly pale green towards the edges. The Man stares up at the sky and shields his eyes from the setting evening sun. As wonderful as they look, they are not quite ripe yet. He roots around in the plant and exposes some that still have a way to go before they can be plucked or eaten. The top exposed Pentacles are much closer to complete ripeness. The Man stares back at the sun. He tries to calculate how much more sunshine they might need before they are ready to harvest. Some are more ready than others so timing is essential here. He decides he certainly has to review the situation and may consult with his friend down the road to seek advice. He heads off to find him. Together, the Two Men stand staring at the Setting Sun among the field of Pentacles as the Man explains this latest dilemma. He needs to know when he should harvest his crop. His farmer friend examines the Pentacles and agrees with the Man that this first crop is going to be a tricky one but is where he will get his experience from for future harvests. He agrees that the Pentacles need more sun, some more so than others if he is to get the best price for them at market and a good return on his investment. However, he also tells him that the weather forecast speaks of heavy rain coming in the following week which could delay his harvesting, thus running the risk of ruining some of the Pentacles. This would mean less to bring to market and a loss of profits. It also would mean that much of the Man’s hard work would have been in vain and that would be a terrible waste. The Man is deeply concerned by this news and suggests that he harvest them as soon as possible before the rains came. A few more days in the sun would certainly help but he cannot take the risk of his crop being destroyed. His farmer friend shakes his head and tells him not to worry as he has done all he can right now. His crops are thriving, all the hard work has been done and will pay off. The Pentacles are looking after themselves at the moment with the help of mother nature and the love and care that was put into them. He reminds the Man that the land and soil chosen for this crop was of a very high standard and he had also bought the best quality Pentacle Seedlings. He would live to regret it if sheer impatience and frustration drove him to harvest them before they were ready. He told him that the hard work was sometimes the easiest part of the process. As it approached harvest time it often became mind numbingly tedious and there was always the temptation to just go out and rip them out of the ground for fear of losing them. He himself had lost crops in the past because of lack of patience. After the Man’s friend leaves, he continues to stand in the field staring at his Pentacles. Money is tight at home and he could really do with releasing some of his investement at the market. He has a choice, to take a gamble and harvest in the next few days or leave them another week and try to prempt when the rains will come. If he did harvest early then he might suffer a loss, he may make less profit than he had planned to. If he left them for another week then he could make plenty at the market, even more than he planned or had expected when he had drawn up the financial forecast in his Business Plan. He would make a very healthy return on his investment and all his Sponsors and Financial Backers would be pleased with him. He couldn’t bear to think of what would happen if the rains came before expected. 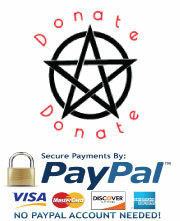 The Man does not like being in this position for as a Pentacle himself, he does not like to take risks or gambles. He has lost before and does not want to go back there. He needs to have a guarantee of a successful result and normally works his life based on that. This situation has him feeling a bit insecure for he has not full control of the outcome. He has very high standards and it is obvious that his Farmer Friend has much faith in him. He needs to relax about the situation now and trust that all will be well. The Man decides to cut off some the smaller Pentacles to take home. He chooses only the ones that might overripen before he can get them to market. These he will take home and use for himself. He will live on these Pentacles for the moment while he waits for the full crop to ripen. He will not dip into the main crop for that is his nest egg. The smaller Pentacles will do him just fine at the moment and is all that he needs. Let us take our leave of the Man now for he has much to think about. In a few weeks, his crop will be completely harvested and the field will be bare once more. He will then find himself at a crossroads and must make a decision how he progresses from there. He must decide whether to plant another crop of Pentacles or do something else. Maybe he might like to branch out into other areas or do something completely different. He has certainly learned a lot and when he collects his share of the profits from his crop he will have adequate funds to do as he wishes. He really is in a very advantageous situation right now. Life is good and he must give himself the credit he deserves for it is not by chance that he has arrived at this day. He has worked damned hard to get where he is. He picked himself up off the ground, dusted himself down and got back on the road again. I have no doubt that from here on in this man will make a success of anything he turns his hand too. Now that the hard work is done, the Man heads off away from the field. He has a meeting with his Wealthy Friend and Sponsor. Together they will be sitting down to review the Business Plan ahead of the Harvest. It will be interesting what comes out of that. Their accountant will also be interested in the net profit once everything is taken into consideration. No doubt the Man will also be going over his own plan at some stage. He now has some time to review his life to date and see if he is still heading in the right direction. Well done. What a great success story. 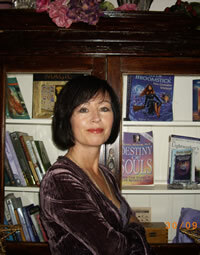 * Next time we visit the Pentacles in Card Eight, it will be interesting to see how they are faring. Have they managed to get back on their feet or has it all fallen apart again? Will they manage to harvest their crop on time and how profitable will it be? Will it have been worth all the hard work and effort or will they feel it was a waste of time? Where will they go from here? Is it possible for them to do even better, to be more successful? I have a good feel about the Pentacles doing well in the future. I know they went through a really rough patch in the Five but by the looks of things in this Seven, they have made a comeback and are in fighting form. The best of luck to them. I was having a block with a yes/no reading and this helped me to clarify. So thorough! Thank you! You are very welcome Tacey. I am glad you found the information helpful.